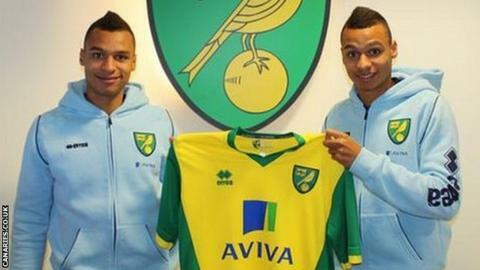 Norwich City's identical twins Josh and Jacob Murphy will wear different colour boots to help boss Chris Hughton distinguish between the two. The 18-year-old wingers have yet to play a senior game together, but both have made their first-team debuts. "It's something we spoke about a while back," Hughton told BBC Radio Norfolk. "Certainly in possession games that we might play, it's going to be more difficult to tell them apart." He added: "It's not so much in close proximity, because there is a difference between the two and they have different playing styles so I can tell them apart. "The more they've been with us, the more you can tell them apart." Josh, wearing orange boots, scored on his Canaries debut in a League Cup victory over Watford earlier this season. And at the weekend, in his first start, he came off in the to be who made his first Norwich appearance, wearing blue boots. The pair were central to the Carrow Road side's FA Youth Cup success last season, with Josh scoring in the second leg of their final with Chelsea.